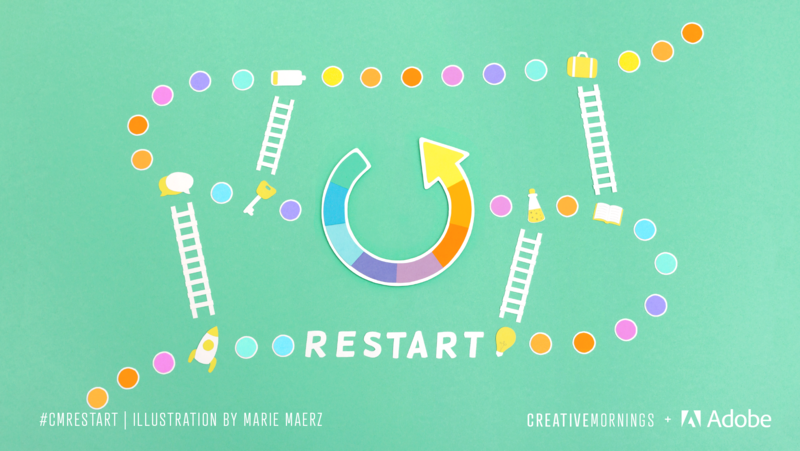 The CreativeMornings/Cologne chose this month’s exploration of Restart, Marie Maerz illustrated the theme, and it is being presented globally by Adobe. Nina und Patric Faßbender RESTART: Die Toniebox. Zachary, Michelle, Amanda Ready. Set. Restart. I'm a woman. I had to play the game twice as hard as anyone else to get to the top. It took three websites and seven years to go from launching my company and leaving the ad industry. Maybe that’s the biggest journey you have to make. The journey is not outward but it’s the journey inward to battle your own demons and to make space - really make space for creativity to flow through you. It was beautiful because the pressure of success was gone and the time to explore what my creativity was, what I wanted to put into this world, started. One thing is for sure, we are all creative beings. But do we give ourselves the time, and the space, and the environment to experiment that? To find that out? You'll find your spark to be a reliable guide. And it will guide you not from fear or greed but from a place of love—discovering new connections where you once saw divisions and beauty where you once saw banality. And the boundaries of your identity will start to rearrange themselves into the shape of your heart. If we live in constant restart, we will find ourselves prepared for the unexpected, adaptable, grounded and inspired. We will grow, find deeper understanding, empathy, light, perspective, our better selves and love. If we really wish to grow creatively, emotionally, intellectually, we must live in constant restart. We must embrace the unexpected, challenge ourselves to take risks, see the world differently, try new things and eat giant sandwiches. Discover the unknown. Experiencing something new makes you new. If you take a step back from things and clear your head, you can rejoin and look back at it with fresh eyes. The best ideas and life decisions often come when we embrace simple truths, and simple ideas are sometimes the most powerful. The next time you're having a bad day or you're rethinking your path, remember, that the bad days are what literally make the good days exist, that no matter what you're going through, someone has been there before and that you're never alone in your endeavors because your community is right here for you. Choose a path that works towards your definition of success. We should all live lives where work and play are so seamlessly intertwined that it always appears that we're doing both. The very phrase work-life balance in itself connotes that work and life are two separate things, when in reality it should be one. Those adults that were in addiction now once were children, but now I turn my back on those same people, just because they're older? I don't think that any of those folks chose their heredity, nor their childhood trauma. When my hands are dirty, when my schedule's messed up, when I'm helping someone else...I'm surprised, sometimes by how crazy my life can be, and it's hard. But because we're really working for each other, and it's not just for me, it's not just for my gain...it's really strong. People who need help in addiction look just like everyone who is sitting here. Those relationships—if you deny someone opportunity, they lose those relationships. I think it's super important that we recognize that. Jobs are critical, but the relationships that we gain in the jobs that we have are huge. Do you recognize how many of your closest friends you met at work? Can you imagine? I bet over half of you would be happy to leave your job now, if you could take all of your friends with you at work...we cultivate so many wonderful relationships that are so integral to who we are, and what we become, at work. To be an American means fighting for your rights. Civic engagement is one of the most American things you can do. It utilizes your experience. It utilizes the freedom that you have to speak on anything. It utilizes a democracy because somebody has to listen to you. It took a lot of self-reflecting as I became an adult to think about my life, to think about some of the things that had happened, and to see that it was truly an American story. It was rising up and working and being scrappy and being hungry and trying to get educated, and more: things that Americans have been engaged with since the founding of this country. Sometimes the hard path is the path to success in your own heart, in your own soul, and in your own mind. It doesn't have to be easy, it just has to be good. Every restart is influenced by every flavor and previous iteration. We can welcome restart without self-degradation or fear. In order to keep evolving as creatives and human beings, we must come to a place of honoring and respecting the past, that by doing so we actually have the freedom to restart as many times as it is necessary. November 9 David Schmeikal | Your Path, Your Choice. November 16 ¿Cómo ser creativo en medio del reseteo? November 16 Goals with SOUL. Are you ready to Restart? November 23 Emma Lindahl - Reset. Restart. Redo. November 29 Oana Sandu on "Restart"
November 30 Libby Lam on RESTART & CreativeMorningsHK turns FOUR! November 30 David TWOSE : Ne jamais laisser ses passions de côté !